We’re delighted to be helping KAZE launch their new single, Fierce! KAZE are delighted to announce their first dates of 2018. With the promise of new material arriving very soon, the duo comprising Graham McCusker and Amy Webber will be hitting the road for a short series of live appearances in Edinburgh, Glasgow and Manchester throughout April 2018. Hailed as ‘fresh sounding, future-facing’ by BBC 6 Music’s Tom Robinson and praised by BBC Radio Scotland’s Vic Galloway for their ‘operatic, off-kilter, syncopated prog-pop’, KAZE have already firmly earmarked themselves as a band who demand your attention. 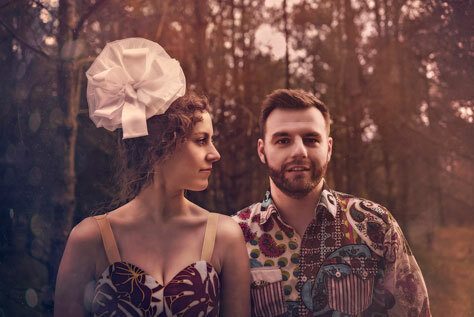 Formed around Graham McCusker from Paisley and Amy Webber from Kent, KAZE’s story first began when the pair acquainted studying opera at the Royal Northern College of Music, Manchester. Finding a natural chemistry from the off, they soon began writing and performing together; Amy providing the soaring, operatically-charged vocals and lyrics that are so intrinsic to their spellbinding sound and Graham masterminding the complex and definitive musical arrangements from the keys and beyond. However, the band’s origin was far from plain sailing, with Graham being diagnosed with a leukaemia in 2016. While he went through the trials and tribulations posed by the chemotherapy treatment, the pair used their time spent together for the positive by creating new and beautiful music out of this world. The songs to emerge from this time became KAZE’s exceptional 2017 debut EP: No Filter, a release that was not only launched with a sell-out capacity show in Manchester, but also commemorated the triumphant completion of Graham’s course of treatment. Among the tracks on the No Filter EP was striking single Pinned On You, which was picked up radio play from the likes of BBC 6 Music, BBC Scotland (Single of the Week), BBC Radio Manchester and more; whilst having their one-take music video for the track made ‘Video of the Month’ by OurStage and consequently selected as ‘Artist of the week’ for Richer Unsigned. Main support comes from Angus Munro, a piano-based singer-songwriter living in Edinburgh, Scotland. Opening the show is Ruth Owens. Raised in Birmingham, Ruth Owens is a singer-songwriter/multi-instrumentalist currently studying at the Royal Northern College of Music in Manchester. Her original music takes on a folk/pop style, and since recording her first EP in 2015 her songs have been featured on the BBC introducing mixtape played on BBC 6 Music. The lead track of her EP Strong is also featured as the title track of the independent film Just Charlie by Seahorse Films; recently the film has won several awards including the Audience Award at the Edinburgh International Film Festival.